Some open holes and lots of rock fall on the way up to the saddle where you meet the cool glacier. Crossing onto the cool is over seracs, and the Cool has plenty of open holes. Otherwise easy access, summit is snow free. Roads in good condition, trails in good condition to high camp. No easily accessible water from the Mackinaw to the ridge just below the PCT junction. On the climb, last easy running water was about where we crossed over the divide from the White Chuck glacier remnant (really just a big rock bowl now) to the Suiattle Glacier bowl. Crevasses and seracs on all glaciers, including the Cool, but except for serac crossing we did walk on snow the entire time, and not ice. Summit is snow-free. Particularly hot day for our walk in; we should have gotten started sooner as we hit the ascent up to the PCT in the early afternoon and the switchbacks spend plenty of time in the sun; we were all hot, one person suffered heat exhaustion but we rested, brought water down, and they recovered and were able to continue to camp. We did almost run out of water before finding a trickle just below the PCT junction; there is no readily accessible water from the Mackinaw to just below the junction. Beyond that the walk to camp went smoothly. 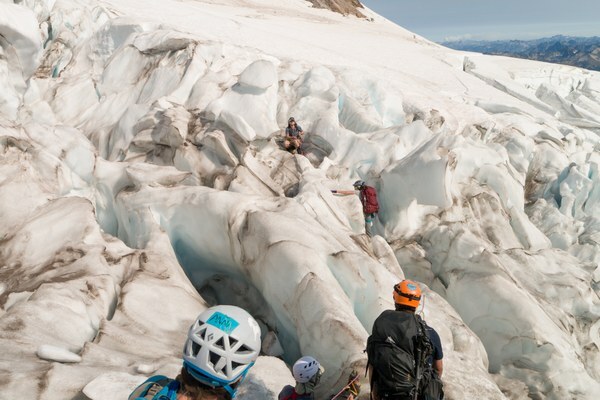 Summit day: We crossed streams from the remnant of the White Chuck glacier very close to the edge of the ice, on the way back we discovered better crossings further west, where the streams are braided. We set off with 11, but 3 turned back and remained at camp just after the crossing. The rest of us continued on. 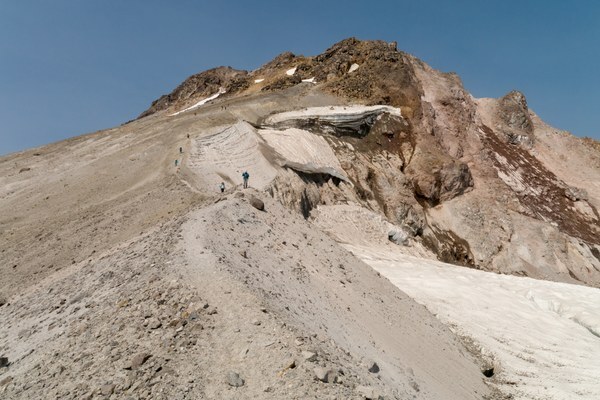 After that and we ascended through loose rocky terrain, following cairns and then obvious trail past high camps to get on the glacier below Disappointment Peak. 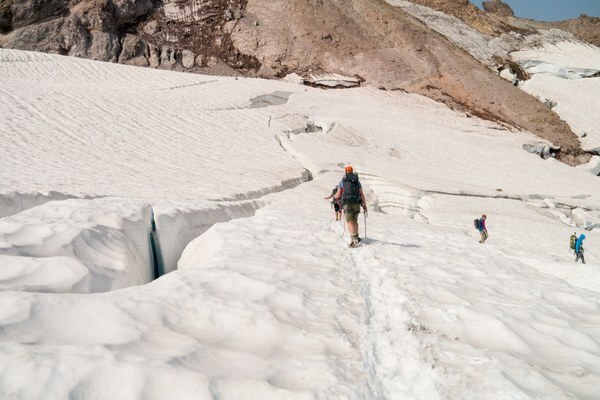 Lots of rockfall and a few crevasses below DP sent us pretty far east to ascend up to the Cool Glacier. Following, we ascended the Cool but had to go north out onto the ice some distance to weave up through crevasses to gain the ridge just above Disappointment Peak, lots of holes, some of them large. There were many teams out, the path was obvious, and we didn't deviate from it. The final ascent to the peak was snow-free and we left crampons and other technical gear at the top of DP. We started moving at about 5am and I think gained the summit at just before 1 pm. For descent, retraced our steps, stopping to pump at first running water source. Way more exciting than I had figured; did not expect seracs based on prior trip reports and beta. Also we had very solid group of people, super supporting, excellent team work; when team members struggled with the heat, everyone else came together to care and share loads. Despite the adversity, one of the better adventures I've been on. I was bummed we did not manage to get everyone to the summit, but the best, safest choices were made given the heat and difficulties from the approach day, and all made it out safely and in good health.